De Beers, the world famous diamond source started this whole “tradition” thing off with a bang back in (we think) the 1930’s and their traditions taught us that Diamonds are our best tool to pop the question to our one true loves. With the help of some New York, Madison Avenue ‘Mad Men’ types, De Beers created this tradition that we just spoke about and made this social convention that we know today a norm. 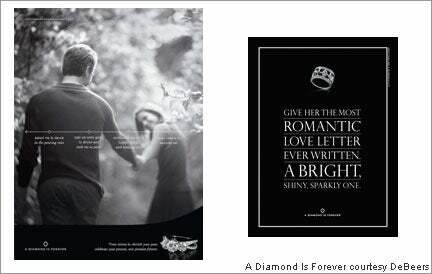 Using their marketing techniques like guides on how much to spend made the ‘diamonds for proposing’ trend into the tradition we know today. And today, the concept is so much in our heads and what is considered to be right for love and marriage today that many couples can’t go without their diamonds for their next stage of their lives. The Hatton Garden diamond district comes into the picture. Londoners wanted in on the action too so in order to get the available London diamond rings into the picture, the Hatton Garden diamond district really had to get involved and from then on it really all kicked off. It was a popular location for diamond jewellery before but this advertising era really brought it into the mainstream mindset of the everyday man. Now he could really know what is considered to be a socially acceptable amount to spend on an engagement ring because that’s what the De Beers ads had told him. The average man in a modern relationship was ready to go. Nowadays, one can pop over to London’s Hatton Garden and walk into any jewellry shop and have thousands of ring options at their fingertips. Whatever you budget, many jewellers will make you a ring, tailor made to your price-tag. The modern day process of buying jewellery has hit main stream with many retailers offering cheaper jewellery options for the masses and low-income to help them feel like they can have the diamonds too. But that is the wrong approach. If you are in the London area, then you should go to the diamond district and find the right piece for you. After all, you don’t want to see your ring on someone else’s hand…do you?